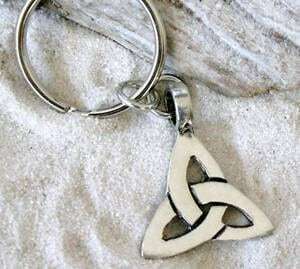 This classic Celtic Triquetra Keychain is handcast and hand-finished in solid American Pewter with a shiny finish resembling antiqued sterling silver. The Key Ring is the classic split ring and measures 1 1/4 inch or 32mm. This three-pronged knot symbolizes the Celtic philosophy that everything has 3 distinct yet interlocked levels ~ Physical, Mental and Spiritual ~ as well as the three domains of earth according to Celtic legend ~ Earth Sea and Sky. Each Triquetra (triangle) is constructed of one line to represent strength and give protection to the wearer.